& makes it so much larger & better in every way. 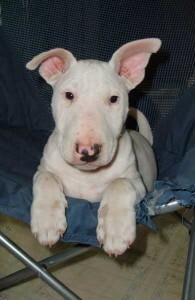 Cornbread was born deaf…… Many Bull Terrier breeders feel it is best to euthanize their deaf puppies because they can be a challenging breed to raise even when they can hear. Cornbread came from a family that thought he deserved a chance and so he came to live at Rocky Ridge. He is a smart, sweet little boy that has won over my heart and I have enjoyed guiding him to his full potential.